For months on end the economic recession has dominated the media and private conversation. The crisis has made us see our present age in a new and problematic light – and the future even more so. Future scenarios have been depicted at various levels. Very few concrete solutions have been put forward, however. With its project Recipes against crisis – recipes born of crisis Bolzano’s Galleria Prisma turned into a testing ground for recipes against this (by no means only economic) crisis. The recipes stand as the fruit of the crisis and also reactions to it. 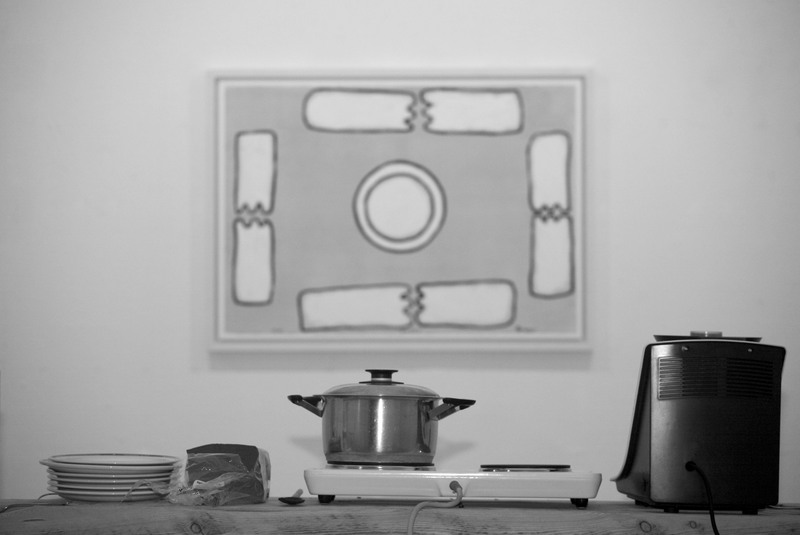 The artist here tackled the phenomenon of crisis by experiment, cookery, philosophy and group-participation. Meetings with invited guests or passing visitors thrashed out the topic and came up with some recipes. All were jotted down on slips of paper, and formed part of the installation. Right in the middle of the exhibition stood a table around which meetings with invited or passing guests took place over three consecutive days. Dotted around the gallery premises were edible wild plants and drawing of plants on table boards. The project ended with a jaunt round Bolzano in search of wild herbs, after which a dinner based on herb-flavoured soup was held at the Prisma Gallery.